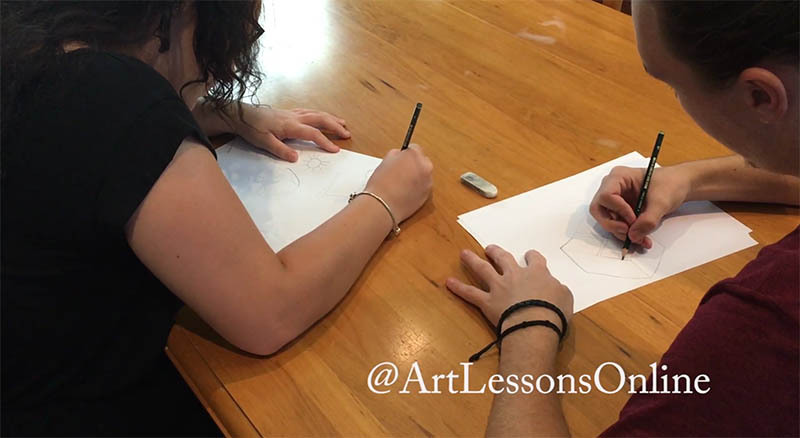 Would you like to give your drawing skills a boost while developing your imagination and creativity at the same time? This Fun exercise does exactly that. It will help your drawing skills by exploring and experimenting with shape and line to create imaginative representations of objects. It will enhance our creativity and lateral thinking skills because we will be requiring our brains to come up with innovative solutions. But enough about the benefits, lets get right into having fun…. The idea here is that we are trying to free our imagination and experiment with shapes. So the trick is to not be too concerned about how the picture is going to look. This in some ways is the opposite to all of the techniques that we have learned so far where we have been concentrating on following very precise shapes. Allowing this freedom in this exercise is very important to give us a chance to experiment without too much concern of the consequences. This allows you to be more creative and helps you to try out new shapes and see what happens. The first time that you do this exercise; you may find it very difficult to come up with ideas. That’s Ok, just take your time and try and relax. The less pressure that you put on yourself to come up with an idea, the easier you find it. So take a deep breath and go with the first thing that pops into your mind, I stress here – DON’T OVERTHINK IT. Start with really simple cartoons or even just go with creating patterns instead of objects. The more that we do this exercise, the easier it gets as we start to activate the parts of our brain that uses imagination. The more we trigger those imaginative responses in our brain, the quicker and easier it is to activate our imagination again.